Previous trailers for Captain America: The Winter Soldier have confirmed the inclusion of Sam Wilson, aka The Falcon. A new clip containing footage and some comments from the cast and crew details the character’s involvement in the film. Introduced in 1969 in Captain America #117, The Falcon was the first African-American superhero in the Marvel Universe. The film version will be played by Anthony Mackie (The Hurt Locker). In the comics, Sam Wilson has the ability to communicate telepathically with any bird and uses a flying harness to soar through the skies. Both the Red Skull and the Cosmic Cube tie into this origin story, but there’s been no sign of either in the film so far. 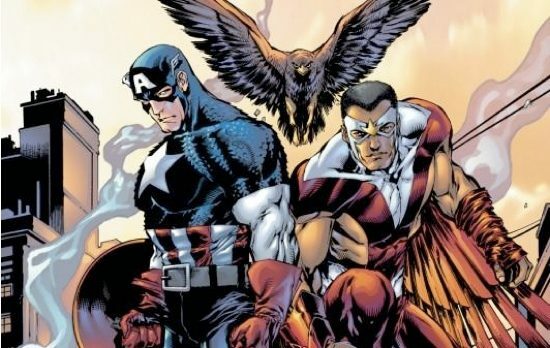 Rather than the traditional sidekick role, the comics set up Falcon and Captain America as teammates and equals. While Winter Soldier still gives top billing to Cap (Chris Evans), Mackie stated in an interview with Screenrant that the film will not limit Falcon to a sidekick role. He joins Cap during what appears to be a conflict within the ranks of S.H.I.E.L.D. and gets to show off the film version of his flightsuit: a combination jetpack and collapsible wings. Are the bird-like design and movement of the wings practical? Probably not, but it definitely looks cool. Audiences can see Cap, Falcon, Black Widow and the rest in action on April 4.